The Hummingbird Cottage is one of 18 Rooms and Suites at Hontoon Landing Resort & Marina. Located on the St. Johns River and directly across from Hontoon Island State Park. Amenities include a Pool, Ships Store, Manicured Lawn and Grounds, Dockside Deli, Pontoon and Fishing Boat Rentals, Narrated Boat Tours and more. The St. Johns River is a nature lover's and photographer's dream. You will see alligators, anhinga, osprey, Great Egrets, Great Blue Heron and much more. Hontoon Landing offers accommodations in a variety of Rooms and Suites. Rentals are available by the day, week or month. For further information, find us on line at Hontoon Landing Resort & Marina. Hontoon Landing also offers two hour narrated tours of the St. Johns River aboard a brand new 35 passenger tour boat, with full bathroom aboard. For more information, find us on line at Heritage River Tours at Hontoon Landing. Time to dine? Check out our Dockside Deli which features Boar's Head products and offers a wide menu of breakfast and lunch selections. Dine inside or outside. The St. Johns River and the world of nature will be your dining companion. For more information, find us on line at Dockside Deli at Hontoon Landing. Canoes and Kayaks are available at Hontoon Island State Park-directly across river from Hontoon Landing. I am a part owner and General Manager of Hontoon Landing Resort & Marina, located on a bend in the St. Johns River, near DeLand, FL. We refer to Hontoon as "A Place Like no Other." Hontoon offers 18 rooms and suites, manicured lawn and Grounds, Sparkling Pool, Ship's Store, Dockside Deli open 8AM-4PM, Pontoon and Fishing Boat Rentals, Hummingbird Garden and much more. The St. Johns River, with its abundant flora and fauna, provides a nature lover's paradise. You will see alligators, anhinga, Great Egrets, Great Blue Heron, turtles and much, much more. I am in the hospitality business. My goal, along with my entire staff, is to assure that our guests have a great visit and see first hand why Hontoon truly is "A Place Like No Other." 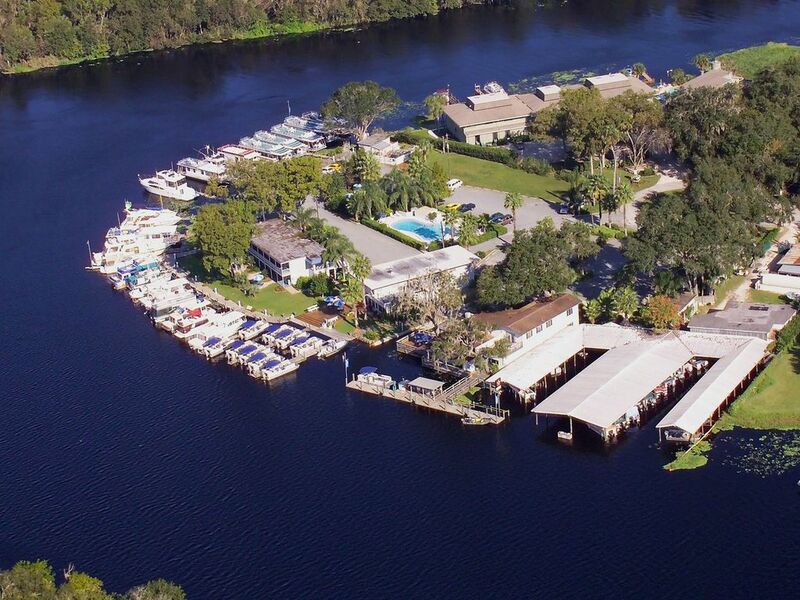 Hontoon Landing Resort & Marina is located on the St. Johns River, directly across from Hontoon Island State Park. Kayaks and canoes available for rental at Hontoon Island State Park. The Park is directly across river from Hontoon Landing. Pontoon boats and fishing boats available for rental at Hontoon Landing. Two hour narrated tours aboard a brand new 35 passenger tour boat depart daily at 10AM and 1PM. Airboat rides also available. Hummingbird cottage was awesome. We spent 3 nights here and enjoyed every minute. April warmly welcomed us and her staff was very kind and helpful. The cottage though dated was sparkling clean. It was very private and quiet. The TV's worked very well and got many stations. The kitchen was amply supplied if you choose to cook. The onsite deli served delicious breakfasts and sandwiches. It was an active marina, and we enjoyed watching the rental boats coming and going. As avid birdwatchers we enjoyed the many birds on the river. We would highly recommend Hontoon Resort and Marina. Thank-you for taking the time to write a review, it is appreciated. Humming Bird Cottage hits the mark - so cute. A lovely little hideaway. As a couple we stayed at Hummngbird Cottge (number 3) for four nights at Hontoon Landing Resort and Marina. What a find. The little cottage is set up for two people perfectly (with wheelchair access). There are kitchen amenities (fridge, cooker, microwave), dining table and chairs, separate room with double bed and en suite shower and toilet. A little shed on site with coin operated washing machines and dryer - what more could you want? We hired a pontoon boat for one day and took our time floating around the St John's River bird spotting. We took 100's of photos so we could identify them all on our return. We saw many alligators, though I'm sure there were more that saw us. We found playful otters and watched a few manatee cruise past. They also offer organised 2 hour cruises from the marina. The Hontoon Marina Deli provides a great breakfast and the staff were ALL so chatty and welcoming. Mary Lou introduced us to Whitey the Great Egret who comes when called for his minnows. We were able to photograph a Limpkin showing off how he eats mussels. We caught the ferry over to Hontoon Island and spent a few hours wandering around taking in the sights and sounds. There are minimal facilities on the island but you can camp or use their cabins which are all very basic. We had a fabulous time, thank you, I just know we WILL go back. Very best wishes Sue and Richard. Anytime I spend time in DeLand, FL, the Hummingbird Cottage at Hontoon will be the place that I would stay. The cottages furniture, especially televisions are outdated, but the cottage itself was great. I'm happy that there are rules put into place especially for quite time from 11:00 p.m., to 8:00 a.m. It was very peaceful and the St. John's River is beautiful. Great place to stay! We enjoyed the quiet of the area and the proximity to the venues we had to attend for a wedding. Nothing was over 30 minutes away so it was a relaxing getaway. It was a very clean and beautiful place. Rooms were comfy and large. The staff were friendly and helpful. The pool was wonderful. Conveniently located between Daytona Beach and Orlando. Deland is a nice little town to visit.